Diablo magazine was recognized by the Western Publishing Association for their outstanding editorial and design. 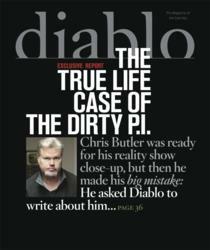 Walnut Creek, CA- Diablo magazine has received two MAGGIE Awards for magazine excellence from the Western Publishing Association. The winning awards were for Best Series of Articles for Diablo magazine's April issue "The Setup" and "On The Record," and for Best Overall Design/Consumer for Diablo’s November Food Issue. The editorial award was given for Diablo magazine’s April cover story, “The Setup” and December feature article, “On the Record.” This series of articles by Senior Editor Peter Crooks gave readers the inside story on how a confidential informant and the State of California’s Department of Justice exposed the alleged criminal activities of Chris Butler, a former SWAT police officer turned private investigator, and Norm Wielsch, the former commander of the Central Contra Costa Narcotics Enforcement Team (CCCNET). Wielsch and Butler were both charged by the Contra Costa District Attorney’s office with 28 felony counts, including stealing and selling narcotics from police evidence lockers. The design award was given for Best Overall Design for Diablo’s November Food Issue, featuring Art Director Roger Gurbani’s layouts showcasing the East Bay food scene. The Food Issue featured Diablo’s annual “Food Awards” highlighting the East Bay’s best restaurants, judged by northern California’s top foodies. The issue also featured “Chasing the Perfect Brew,” a behind the scenes look at Blue Bottle Coffee and other stars of the beverage’s third wave. “We are honored to be recognized by the Western Publishing Association. The MAGGIE Awards are a testament to our pursuit of editorial and design excellence and content to deliver stories that are relevant and important to our readers,” notes Barney Fonzi, group publisher of Diablo Publications.